There’s buzz these days about how the hunting and outdoor recreation communities can come together on issues of conservation and wildlife. But what often gets missed is the aspect of multifunctional gear that can serve outdoorspeople across multiple disciplines. And when a popular hunting brand teams up with a popular outdoor brand, it paves the way for new conversations. Meet the Nemo x First Lite Field Collection. First Lite has a history of catering to the multitasking backcountry hunter. Its emphasis on layered systems echoes the needs of the mountaineering community. Case in point: The Ketchum-based staffers are known to ski the slopes in fusion camouflage. So does two-time Olympic Gold Medalist and four-time X Games Gold Medalist David Wise. In my opinion, it’s also one of the few hunting-specific brands with a message that feels accessible to the all-around outdoorsperson. The brand was born out of a dearth of neutral tones and camouflage materials in the outdoor recreation-focused merino market. First Lite nailed that market — its Kiln series is my personal favorite for all activities at the moment. It later made its way into outerwear for both men and women. And their strong effort to bridge the gender gap has been well received in the hunting community. “We partnered with NEMO because they know ultralight camping equipment better than anyone. We started by looking at their most technical products and then worked together to adapt them to the needs of hunters,” said Bridget Noonan, First Lite’s marketing director. And First Lite is primed for partnership in that space. In that vein, NEMO Equipment founder Cam Brensinger is himself a newer hunter. He and Bill Kramer, a longtime hunter and NEMO’s creative director, are shaping the way the brand does business in the sporting world. Kramer and Brensinger joined the First Lite crew in Idaho last fall to put the new gear through its paces. The brands released the new collection at this year’s Sheep Show. Here are the pieces we’re excited about at GearJunkie. 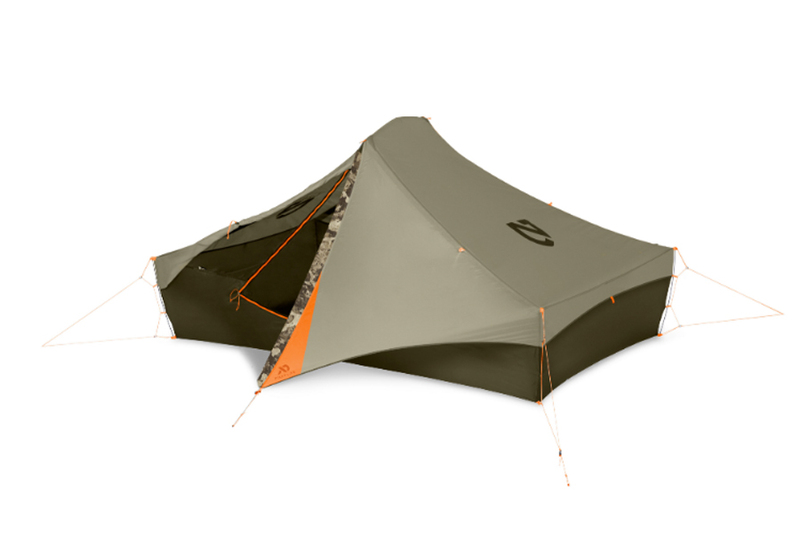 Dropping for consumers in summer 2019, the collaboration boasts a series of tents, sleeping bags, sleeping pads, and a few camping pieces to round it out. Pricing varies and is steep for some items, but it’s akin to pricing for top technical gear across the industry. The tents are all floored, a step away from the floorless models that have saturated the hunting industry over the past few years. 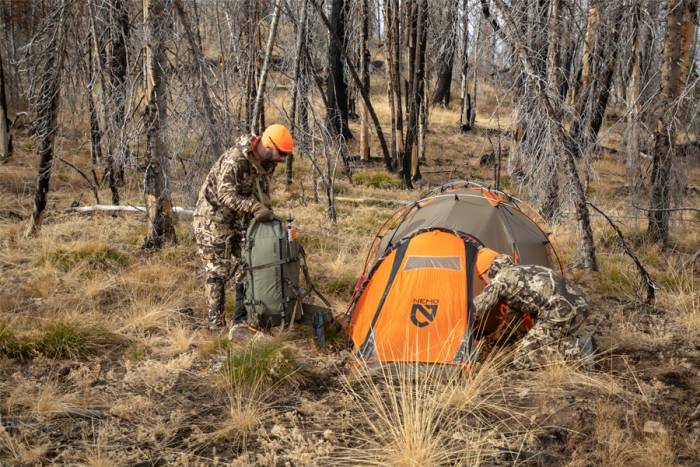 I’m a fan of the floored tent, and I’m glad to see the line reflect the need for flooring in multiple hunting scenarios. Bugs, boggy mud, ice, and snow can all be issues with the floorless tents, especially for hunters that transition across seasons and landscapes. The Recurve ($470, above), in particular, caught my eye with its unique shape, trekking pole compatibility, and featherweight 1 pound 6 ounces. At that weight, I’m happy to carry it on solo treks just to have the extra space for my pup and equipment. And it’s only 1 ounce heavier than the one-person Spike ($250). The price points differ by $210 on the two tents, though, with the extra space coming at a premium. 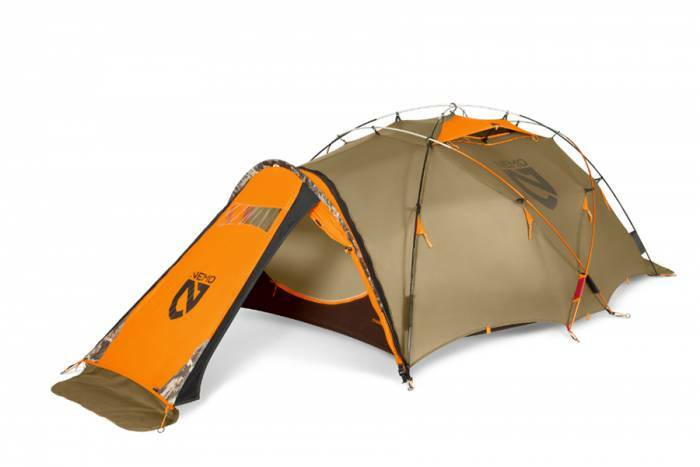 The four-season Endurance ($730, above) is the most technical piece within the tents. 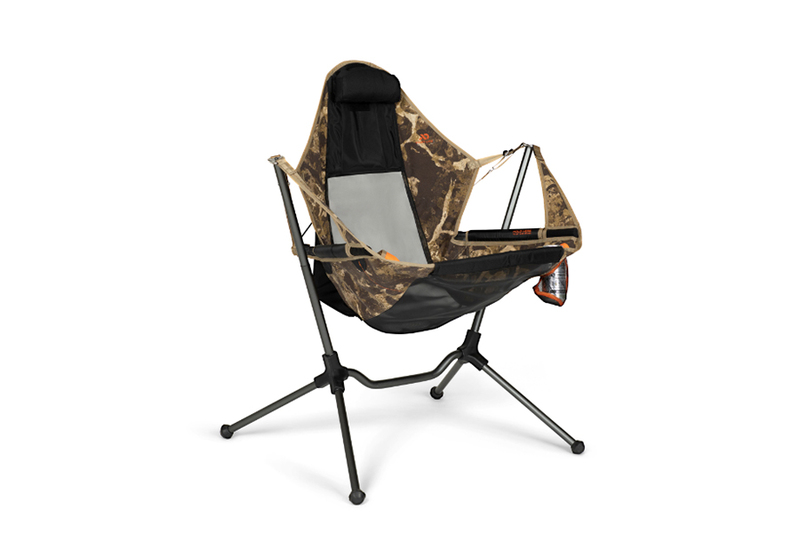 It has the burly look of your typical mountaineering tent with the neutral tones and Fusion accents from First Lite. At 6 lbs 13 ounces, it’s not a light piece of equipment. The three- to four-season Kodiak ($520) is a bit more nimble at half the weight of the Endurance. But it’s burlier than the Recurve to get you all the way through the season. The sleeping bags each have NEMO’s patented Thermo Gills, a zippered technology that allows you to vent body heat and manage temperature as needed. With that in mind, the pictured zero-degree Stalker ($520) seems easily adaptable across a four-season hunting plan for those of us that sleep cold. There are also 20- and 35-degree options, but why have more than you need? At $230, the other sleeping bags are definitively more affordable. Hot sleepers, take note. 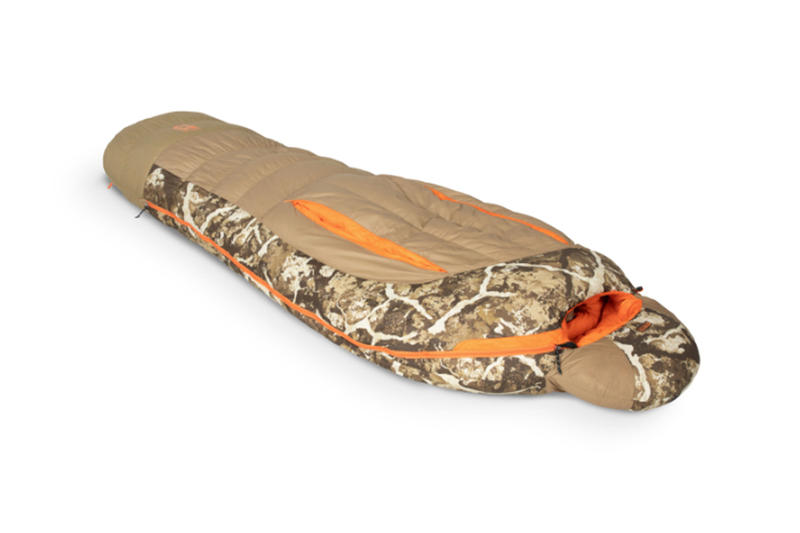 The two sleeping pads offer an affordable, ultralight, closed-cell foam option in the 14.5-ounce Switchback ($50). But the Longbow Alpine ($240) boasts four-season insulation. At 1 pound 2 ounces, it’s heavier than I’d prefer. But if it’s as quiet as the brand says, it could be a nice upgrade from louder compact pads. The price point on this seems prohibitive compared to other insulated options I’ve tried. But if Z-pads are your thing, the Switchback seems like it could be a good option. Out of the camping equipment, the Fusion-laced Stargazer Recliner Luxury Chair ($230) isn’t going to be your backcountry go-to at 6 pounds 5 ounces. But you might switch out your living room furniture once you sit in it. We had a bevy of these at my all-women deer and elk camp this past fall, and you were in for a fight, as they’re by far the best seat in the house. I came into the hunting world through the backpacking world. And I often find myself flummoxed as to how and why brands have seemed to miss the boat on drawing the connection between gear that’s multifunctional, light, and durable. These two brands, in particular, have served me at multiple points as an outdoorswoman. And when I saw they’d come together on a collection, it made sense. Both brands foster a sense of adventure, both staffs run the gamut across outdoor activities, and they’re both supporters of public land and conservation. “As is the case with any activity we support, we count on our customers to approach their engagement with the natural world with respect and an eye for sustaining these privileges for future generations,” Brensinger added as his final point. Kenton Carruth and his First Lite team have consistently pushed this conservation ethic — long before the hunting industry caught up with this common ideal between the two industries. After talking with both brands, it’s clear that it’s a mutual collaboration that looks to continue into an extended future. I’m looking forward to putting the gear through its paces in the multiple activities I pursue. I can’t wait to see how it holds up to the test.